Derbent (Roushie: Дербе́нт; Azerbaijani: Dərbənd; Lezgian: Кьвевар; Avar: Дербенд; Lak: Чурул / Churul; Persian: دربند; Judæo-Tat: דארבּאנד / Дэрбэнд / Dərbənd) is a ceety in the Republic o Dagestan, Roushie, close tae the Azerbaijani border. 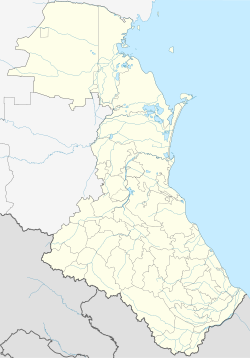 It is the soothmaist ceety in Roushie, an it is the seicont maist important ceety o Dagestan. Population: 101,031 (2002 Census); 78,371 (1989 Census). The main ethnic groups are: Lezgins, Azeris an Tabasarans. Aften identifee'd wi the legendar Gates o Alexander, Derbent claims tae be the auldest ceety in Roushie. Syne antiquity the value o the aurie as the gate tae the Caucasus haes been unnerstuid an Derbent haes airchaeological structurs ower 5,000 years auld. As a result o this geografic pairticularity the ceety developed atween twa walls, stretchin frae the muntains tae the sea. These fortifications wur continuously employed for a millennium an a hauf, langer than ony ither extant fortress in the warld. Ower the years different naitions gave the ceety different names, but aw connectit tae the wird 'gate'. 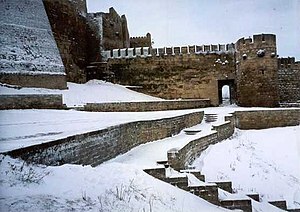 Its etymology derives frae the Persian Darband ("closed gate"); it wis kent tae the Arabs as Bāb al Abwab ("Gate o Gates") an to the Turks as Demirkapı ("Iron Gate"). The modren ceety is built near the wastren shores o the Caspian Sea, sooth o the Rubas River, on the slopes of the Tabasaran Muntains (pairt o the Bigger Caucasus range). Derbent is well served bi public transport, wi its awn harbour, a railway goin sooth tae Baku, an the Baku tae Rostov-on-Don road. Tae the north o the ceety is the monument o the Kirk-lar, or fowerty heroes, who fell defendin Dagestan against the Arabs in 728. Tae the sooth lies the seaward extremity o the Caucasian wall (fifty metres lang), itherwise kent as Alexander's Waw, blockin the narrae pass o the Iron Gate or Caspian Gates (Portae Athanae or Portae Caspiae). This, when entire, haed a height o 29 ft (9 m) an a thickness o aboot 10 ft (3 m), an wi its iron gates and numerous watch-touers formed a valuable defence o the Persian frontier. View o the ceety frae Naryn-Kala, 1910s. Derbent haes an important strategic location in the Caucasus: the ceety is situatit on a narrae, 3-kilometre strip o land atween the Caspian Sea an the Caucasus muntains. Historically, this position alloued the rulers o Derbent tae control land traffec atween the Eurasie Steppe an the Middle East. The anerlie ither practicable crossin o the Caucasus ridge wis ower the Darial Gorge. The first intensive dounset in the Derbent aurie dates frae the 8t century BC; the steid wis intermittently controlled bi the Persie monarchs, stairtin frae the 6t century BC. Till the 4t century CE it wis pairt o Caucasie Albanie, an is tradeetionally identifee'd wi Albana, the caipital. The modren name is a Persie wird (دربند Darband) meanin "closed gates", which came intae uise in the end o the 5t or the beginnin o the 6t century AD, when the ceety wis refoondit bi Kavadh I o the Sassanid dynasty o Persie. The twinty-metre-heich waws wi thirty north-leukin touers are believit tae belang tae the time o Kavadh's son, Khosrau I o Persie. The chronicler Movses Kagankatvatsi wrote aboot "the wondrous waws, for whose construction the Persie keengs exhaustit oor kintra, recruitin airchitects an collectin biggin materials wi a view o constructin a great edifice stretchin atween the Caucasus Muntains an the Great Eastren Sea." Derbent became a strang militar ootpost an harbour o the Sassanid empire. Durin the 5t an 6t centuries Derbent becomes an important centre for spreadin the Christian faith in the Caucasus an aw. Movses Kagankatvatsi left a graphic description o the sack o Derbent bi the hordes o Tong Yabghu o the Wastren Turkic Khaganate in 627. His successor, Böri Shad, pruivit unable tae consolidate Tong Yabghu's conquests, an the ceety wis retaken bi the Persians. In 654 Derbent wis captured bi the Arabs, who transformit it in an important admeenistrative centre an introducit Islam tae the aurie. Acause o its strategic position on the northren branch o the Silk Route, the fortress wis contestit bi the Khazars in the course o the Khazar-Arab Wars. The Sassanids haed brocht Armenies frae Syunik' tae help protect the pass frae invaders an aw; as Arab rule weakened in the region at the end o the nint century, the Armenies livin thare wur able tae establish a kinrick o their awn, which lastit till the early years o the thirteent century. The recent excavations on the eastren side o the Caspian Sea opposite tae Derbent, hae revealed the eastren coonterpairt tae the waw an fortifications o the ceety in the Great Waw o Gorgan. Similar Sasanian defensive fortifications—massive forts, garrison touns, lang walls—are seen on the eastren shores o the Caspian extendin literally intae the sea as they are witness emergin frae the risin waters o the Caspian in the wast at Derbent. The Caliph Harun al-Rashid spent time livin in Derbent, an brought it intae great repute as a seat o the airts an commerce. Accordin tae Arab historians, Derbent, wi population exceedin 50,000, wis the lairgest ceety o the 9t century Caucasus. In the 10t century, wi the collapse o the Arab Caliphate, Derbent became the caipital o an emirate. This emirate aften focht losin wars wi the neebourin Christian state o Sarir, allouin Sarir tae occasionally manipulate Derbent politics. Despite that, the emirate ootlived its rival an continued tae flourish at the time o the Mongol invasion in 1239. In the 14t century Derbent wis occupee'd bi Timur's airmies. In 1437 it fell unner the control o the Shirvanshahs o Azerbaijan. Durin the 16t century Derbent wis the arena for wars atween Turkey an Persie ruled bi the Iranian Safavid dynasty. Ottoman Empire gained control o the ceety follaein the Battle o the Torches in 1583 an Ottoman awnership was secured wi the Constantinople Treaty (Treaty o Ferhat Pasha) in 1590. Bi the 1735 Ganja treaty Derbent fell athin the Persie state. In 1722 durin the Rousho-Persie War, Peter the Great o Roushie wrestit the toun frae the Persians, but in 1736 the supremacy o Nadir Shah wis again recognisit. In 1747 Derbent became the caipital o the khanate o the same name. Durin the Persie Expedition o 1796 Derbent wis stormit bi Roushie forces unner Valerian Zubov. As a consequence o the Treaty o Gulistan o 1813—atween Roushie an Persie—Derbent became pairt o the Roushie Empire. A lairge portion o the waws an several watchtouers hae been preservit in reasonable shape. The waws, reachin tae the sea, date frae the 6t century, Sassanid dynasty period. The ceety haes a well preservit citadel (Narin-kala), comprisin an aurie o 45,000 m², enclosed bi strang waws. Historical attractions include the baths, the cisterns, the auld cemeteries, the caravanserai, the 18t century Khan's mausoleum, as well as several mosques. The auldest mosque is the Juma Mosque, built ower a 6t century Christian basilica; it haes a 15t century madrassa. Ither shrines include the 17t century Kyrhlyar mosque, the Bala mosque an the 18t century Chertebe mosque. The ceety is hame tae machine biggin, fuid, textile, fishin an fishery supplies, construction materials an wood industries. It is the production centre o Roushie brandy. The education infrastructure is fairly extensive; there is a university as well as several technical schuils. On the cultural front, there is a Lezgin drama theatre (S. Stalsky theatre). Aboot twa kilometres frae the ceety is the vacation colony o Chayka (Seagull). Derbent bein in practice a huge museum an wi magnificent muntains an shore nearbi, a great potential for development o the tourism industry exists, further increased bi UNESCO's classification o the Citadel, Auncient Ceety an Fortress as a Warld Heritage Steid in 2003; housomeivver, instability in the region haes no alloued further development. Coat o airms o Derbent (1843). A gate in the auld ceety o Derbent. A gate o the citadel. ↑ See (in Armenie) Sedrak Barkhudaryan, “Դերբենդի հայ-աղվանական թագավորությունը” (“The Armenian-Caucasian Albanian Kingdom of Derbend”). Patma-Banasirakan Handes . № 3, 1969, pp. 125-147. ↑ (in Armenie) Matthew of Edessa. Ժամանակնագրություն (Chronicle). Translated by Hrach Bartikyan. Yerevan: Hayastan Publishing, 1973, pp. 151-152, 332, note 132a. Wikimedia Commons haes media relatit tae Derbent.